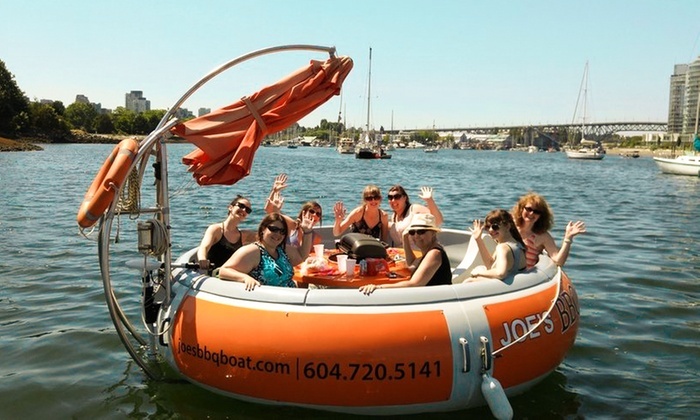 Rent one of our Donut boats for your birthday, bachelorrette party, or any event. See Milwaukee from the water and be seen from the Riverwalk on your very own Donut boat. We provide a cooler in the center of the boat stocked with ice and a speaker you can connect your phone to. Bring any drinks or snacks you would like! Donut Boats are super easy to drive, like a golf cart on the water. Gather around the cooler and have fun with all your friends. 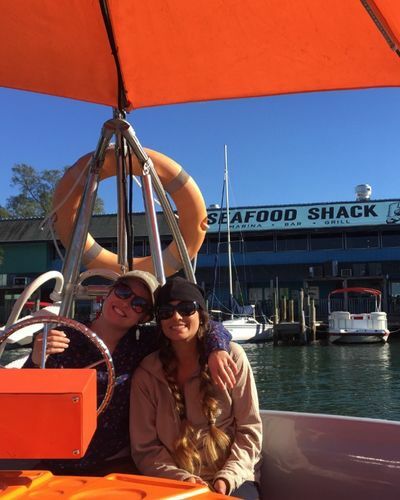 You can fit up to 10 on one donut boat and we have 2 boats so if your groups is large you can rent 2 boats to go out together or we have smaller boats to rent too. The seats are very comfortable and everyone can talk and join in the fun together. $400 for the boat comes out to $40 a person plus taxes and fees. You can add time by booking 2 cruises back to back for 4 hours or call/text/email to add a 3rd hour. You can put down a $200 deposit to book your spot by calling us anytime. These boats are super easy to drive. No experience necessary. If no one in your group is comfortable with driving, you can hire a captain at www.rentcaptains.com. If you rent a captain, you can only have 9 in your group, plus the captain, 10. We have 2 donut boats so if your group is more than 10 call/text to rent both our boats to go out together or we rent smaller retro boats at www.retroboatmke.com. This is the only donut boat on the river, bringing a round booth-like style to the water. Bring all your friends for an exceptional experience that will catch everyone’s eye on the Riverwalk. The boat comes with an umbrella that covers you so we will go out rain or shine, but we want you to have the best experience so we are more than happy to reschedule your cruise or fully refund you if the weather does not cooperate. Please give us a heads up as soon as possible if you need to cancel or reschedule. We can reschedule your tour at any time and if you do need to cancel, we understand and will refund you. If you book online you have to pay ahead of time in full, but give us a call and you can put down a deposit over the phone. Give us a call at 512-808-6381 if you run into any questions or concerns. HOW CAN I SIGN THE rental agreement/WAIVER? Visit www.smartwaiver.com/v/retroboat and fill it out online. Text or email this link to your friends who are coming with you on the cruise. You can also click the button below. Everyone who comes is required to sign the waiver. What if i don’t want to drive the boat? How do i rent a captain? Visit www.rentcaptains.com and they will provide you with a captain at $30 an hour. The boats are very easy to drive like a golf cart. If you rent a captain, you can only have up to 9 passengers in your party. If we have a group of more than 10 can we fit a few more on? Unfortunately due to the rating on the vessel we can only allow 10 passengers on the boat at a time. That 10 includes the captain if you hire one. 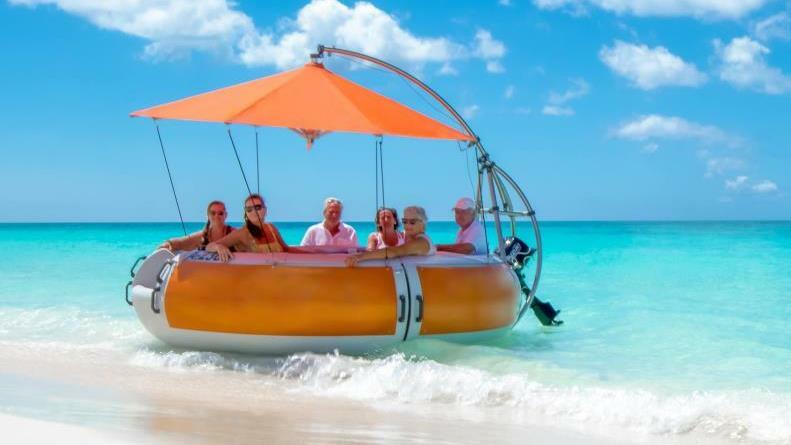 If you have more people in your group, you can rent a Retro Boat which fit 4-6 (see link below) and cruise alongside or rent another donut boat. Check out our Retro Boats!